Blowing up zombies with a blunderbuss is fun no matter what genre it's supposed to be. The DLC pack for Rockstar's Red Dead Redemption is aptly titled Undead Nightmare. As one might expect, the territory of New Austin is suddenly overrun with zombies and it is up to John Marston to figure out why, and hopefully stop it. 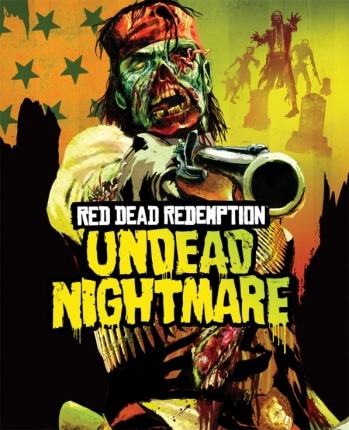 Undead Nightmare offers a single player campaign that occurs in addition to the game's regular storyline. There are new Challenges, such as Undead Sharpshooter, completely new music and a distinct color palette. The addition of more yellows and reds definitely makes you feel that something isn't right in the world. Rockstar is still not announcing a release date for Undead Nightmare, but we do know that it will cost $9.99 and if it doesn't come out before Halloween then that's an epic fail. All of the voice actors returned to record new dialogue and cutscenes. I couldn't get much info on the storyline, but a couple of characters return including Bonnie MacFarlane and the Marshal from Armadillo. The rep I spoke to from Rockstar said that there are more people that you might recognize, but they look slightly different. Read: They're now zombies. I was initially skeptical of adding lumbering, brainless undead to what was a very authentic Western game, but playing it helped convince me otherwise. And those pesky zombies make for more challenging opponents than most of the bandits in the original game. The normal zombies swarm towards you and try to take a bite out of your neck , but there are a few different varieties. One kind looks like she was quite heavy eater in her former life, and, like the grizzly bears, takes more a few shots before she goes down. A headshot drops her cold, though. Another kind of zombies spit acid at you, which is never good. I'm pretty good with the Henry Repeater, but I had a hard time clearing waves of undead without downing tons of medicine or relying on Dead Eye to paint the targets with bullets. The economy is busted, thanks to the attacking zombies. Ammo is more valuable than money, and you trade in bullets rather than coins. That's good because if you've played through Red Dead, you often had way more money than you could ever spend on ammunition or medicine. But because ammo is so valuable to shoot the crap out of zombies, it makes for quite a decision. Do I need this bottle of moonshine or should I just hoard my bullets for the next wave of zombies? The good news is that there's a new weapon in Undead Nightmare which uses zombies parts as ammunition. You harvest zombie parts just as you looted a body, by pressing Y, and you stuff them down the shaft of the blunderbuss. As you can imagine, the blunderbuss is a slow-loading weapon. The blunderbuss is formidable, but thankfully you don't have to be a dwarf to wield it. John Marston uses the blunderbuss to explode the zombies with one super shot. The animation for blowing up zombies is worth the 10 bucks alone; there is an impressive spray of blood and rotting body parts. The blunderbuss is so powerful though that you can't harvest parts from the undead you blow up. The demo I played took place in a graveyard. The territory is filled with these cemetery areas and you as John Marston must first burn five coffins and fight off wave after wave of undead. Completing these areas is akin to the gang hideouts in the original game, with a simple set of objectives to finish before the area is cleared. These areas will respawn over time. Rockstar didn't go into detail with the multiplayer and Free Roam additions in Undead Nightmare but the rep promised that more info would be coming out soon. All in all, I guess I'm happy that John Marston is shooting zombies. Undead Nightmare might be a Left 4 Red Dead mashup but that doesn't mean it isn't fun.